Khenpo Dawa Paljor (Tib. ཟླ་བ་དཔལ་འབྱོར་, Wyl. zla ba dpal 'byor) was born in 1975 in Thimphu in Bhutan as the son of Tsering Lhamo, his mother, and Sangyé Dorje, his father who worked at the royal court of Bhutan. Until the age of eleven Khenpo studied at a regular English school before he started focusing on Tibetan grammar and Dharma studies at the Semtokha school in Bhutan which was founded by Kyabjé Dilgo Khyentse Rinpoche. Finishing school at 18 he traveled to Bodhgaya, and after partaking in the Nyingma Mönlam, he was inspired to monkhood. At the age of 19 Khenpo enrolled at the Namdroling Monastery Shedra. In his penultimate year he went to Bir where he taught at Ringu Tulku Rinpoche's Palyul Chökhorling Monastery. After their nine year education Khenpos are required to serve on behalf of their monasteries for at least three years. In Khenpo Dawé Paljor's case he taught for four years on Vajrayana, Tibetan grammar and other subjects. 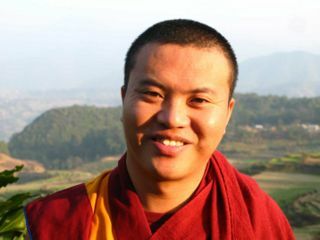 After teaching at the nunnery in Namdroling for a year he went back to teach at the Shedra where he was a former student, before leaving for Dzogchen Monastery in south India where he taught for another year. In the last three years he has been teaching at Kyabjé Dilgo Khyentse Rinpoche's Shechen Monastery where his main subject has been Longchenpa's Finding Comfort and Ease in the Nature of Mind (Tib. Semnyi Ngalso, Wyl. sems nyid ngal gso). Upon leaving Shedra East Khenpo will return to Shechen to continue to teach. Besides his root teacher, Kyabjé Penor Rinpoche, he has been studying with Dzetrul Rinpoche, Khenpo Namdrol and Khenpo Pema Sherab. On one occasion he also received a long life empowerment from Kyabjé Dilgo Khyentse Rinpoche. Currently Khenpo is teaching on Mipham Rinpoche's commentary on the Uttaratantra Shastra. The recordings of those teachings are part of the online Shedra MP3 Library. This page was last edited on 11 June 2018, at 18:11.